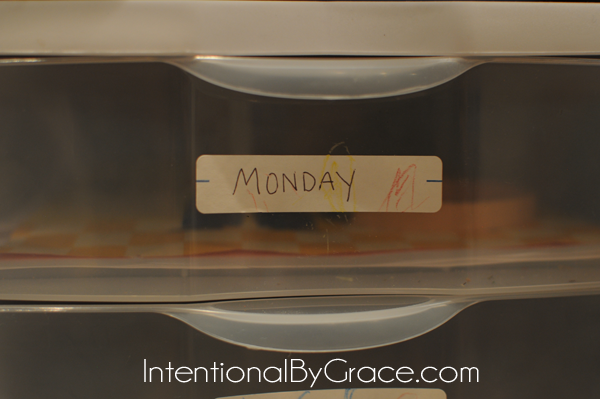 Over the summer, I spent a lot of time getting organized for the upcoming homeschool preschool year. I’ve learned that if I have to plan, prepare, or think about anything the week before I’m supposed to teach something to my son, you can bet your bottom dollar preschool doesn’t happen the following week. When I had my second son, I prepared a lot of Before Five in a Row units ahead of time for my oldest. This way I had something prepared and ready to go that I could do with my oldest when our little one slept. I wanted to help the transition to having a baby brother go as smoothly as possible, so I didn’t want to disrupt our routine of intentional learning time together. I had no idea how much of a HUGE help this would be! I learned something during that season. Taking a few hours to plan at least three months of lesson plans, including gathering all the materials for the lessons made for a very easy homeschool experience. Yes, I spent hours getting everything prepared ahead of time, but we were able to stay consistent and complete our work while having a lot of fun together. Not to mention, this was far less stressful than cramming in a quick planning session on Sunday nights when I’m already exhausted! With this life lesson in mind, I decided to spend a few nights over the summer doing the same thing for my son’s preschool year. Basically, I wanted to set us up for success. 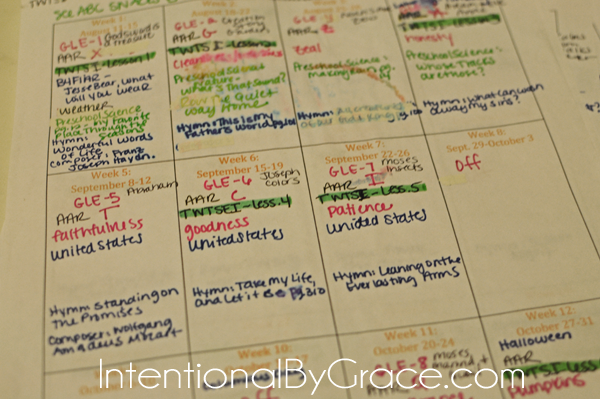 How I organize my homeschool lesson plans for preschool. First, I made a list of everything my child needs to learn in the coming year. I kept it really simple, and I built a running list into a Word document. Underneath each category, I jotted down what I wanted to use as well as the learning focus goals. 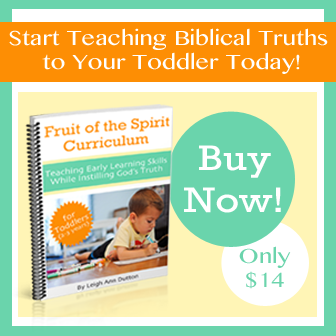 You can see all of my homeschool preschool curriculum choices here. Once I set my goals for the year, I then mapped out a plan. I made a table in a Word document with weeks 1-40 on it. I added the date for each week, as well. Then I went through and wrote “off” on the weeks I knew we wouldn’t be doing formal preschool work. Next, I determined the first day of preschool and the last day. Then, I filled in the holiday weeks for the year. I like to do theme work during those weeks. Making note of the appropriate week for each one helped me not plan any mandatory work for those weeks. Finally, I penciled in each week’s lesson plans needed to complete my curriculum plan for each category. Preschool Science – What’s That Sound? Will we do everything? No, but I penciled it in to help me know what I “want” to do with my son. I adjust as needed for life circumstances and his interest at the time. Now it’s time to get organized. 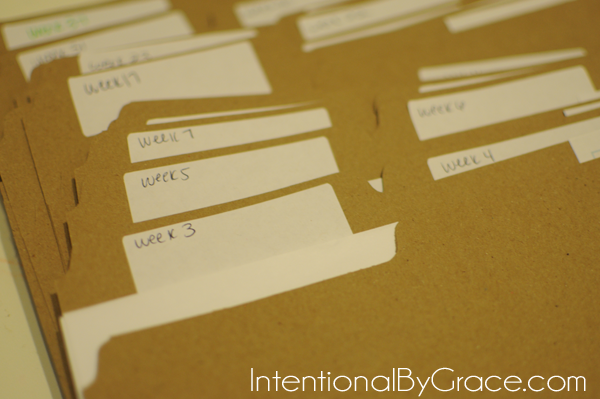 I created a file folder for each week (1-40). 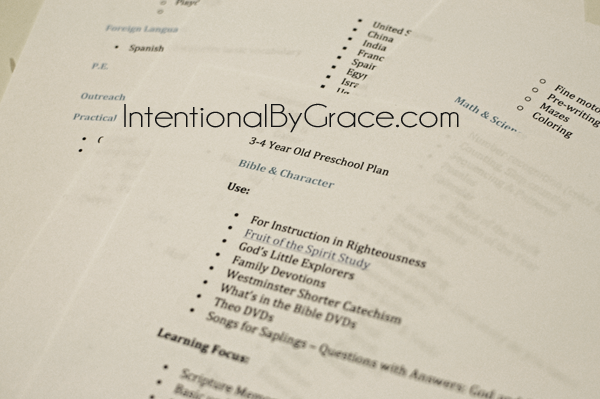 Weekly Lesson Plan Template – I use the one in my Fruit of the Spirit Curriculum, but here’s a free one that I used to use. 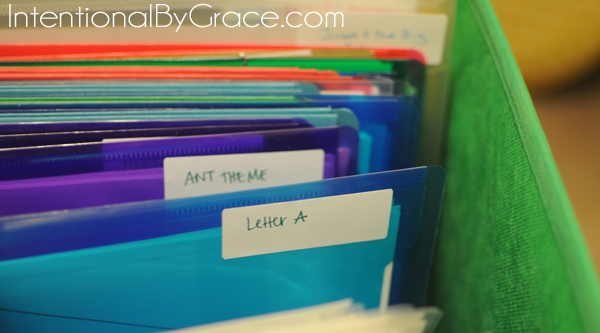 I store the file folders in a basket under my desk next to my theme printables box. 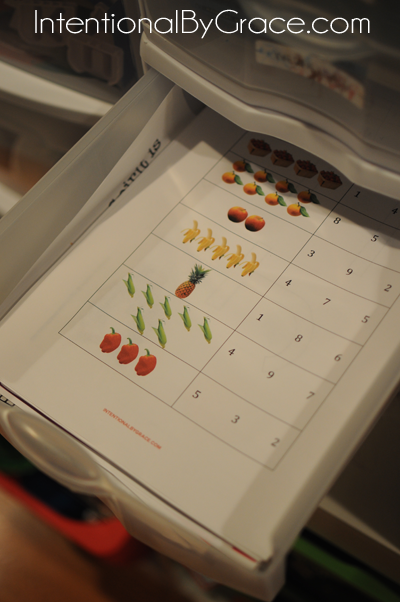 I use this method for storing my theme printables for long-term storage. I’m ready for each week of preschool! Now that I’ve done the bulk of the planning and preparing, my weekly planning is very simple. I pull out my weekly lesson plan template from my file folder and fill it in. I put the printables into my daily box system (printables we’ll do on Monday go into Monday’s drawer, Tuesday’s printables in Tuesday, etc.). I will also add any craft material needed, if I have time. This keeps me from digging around throughout the week, and I can just grab the day’s work from the drawer. The rest of my materials for the week that is not printable related I keep in a pretty woven bag beside our kitchen table. This is basically my teaching manuals for each of the subjects. I found this especially helpful when the day is too beautiful to stay inside. 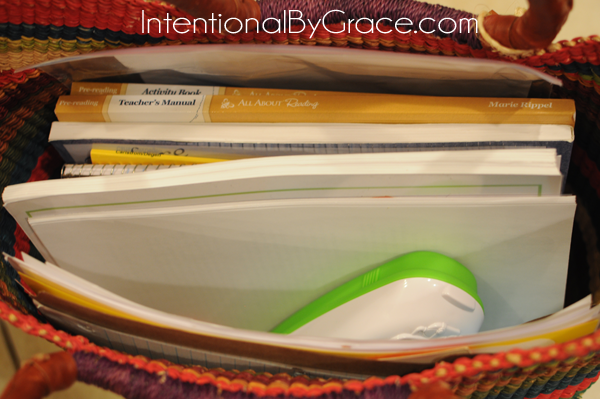 I just grab my day’s drawer material, stick in my already prepared bag, and take the lessons outside to the deck! It was a ton of work on the front end, but it’s made each week go so much more smoothly. With the launch of the Fruit of the Spirit Curriculum, I had to work a lot of extra hours in order to release it on time. 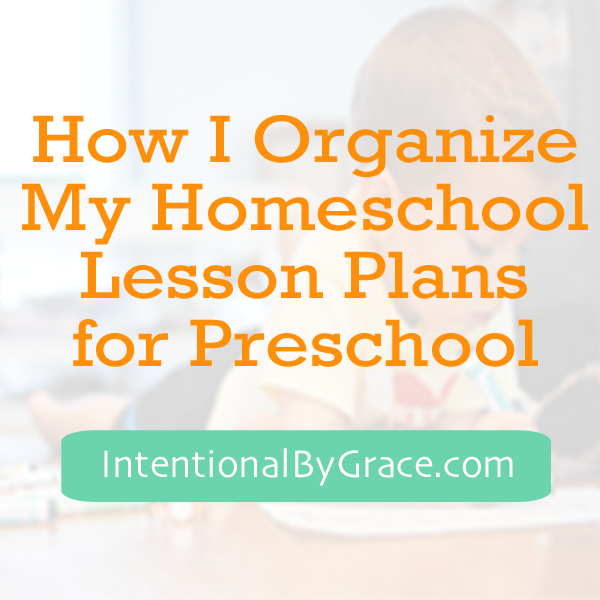 Not having to plan a homeschool lesson plan meant that when life got busy, I didn’t have to give up preschool with my son. I had everything ready to go. It was SUCH a blessing! 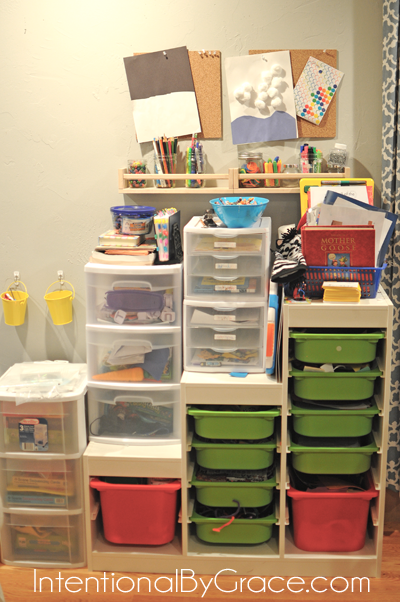 If you want to see what our homeschool set up looked like last year, check out this post. I will get an updated post for our “schoolroom” soon. But last year’s post gives some details about organization that I wasn’t able to cover here today. 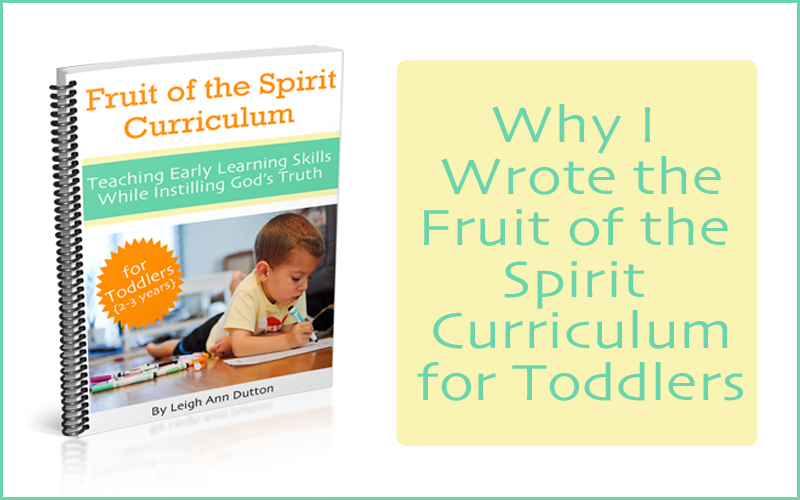 If you’re looking for a curriculum for your toddler, then I highly recommend checking out the Fruit of the Spirit Curriculum for Toddlers. If you’re wanting a more comprehensive look at organizing your homeschool, then I highly recommend Raising Clover’s Homeschool Organization eCourse! It is absolutely phenomenal! You can read more of my thoughts on this eCourse here. This post contains my affiliate links. See my full disclosure here. Hello. I love your blog and find it so encouraging to my life even though I am older and have older children. I found this blog entry helpful as well. I do think however that you can give you and your child a break. It appears you may be making preschool more difficult on the two of you than it has to be. If I could go back in time, For preschool, all I would to do is enjoy them and play games with them..talk to them about everything we were doing in daily life…and read to them a lot of whatever they wanted to read. The organized calendar driven days will be necessity soon enough…for now, just breathe and take a nature walk. You are a fantastic mom it seems, and those kiddos are blessed to have you. I see that you use this with God’s Little Explorers. I have GLE and love it, but i’ve been trying to figure out an easy way to incorporate virtues/character into it and I think Fruit of the Spirit curriculum may be it. I am not a teacher by nature, so I have a hard time with planning across resources. When planning your lessons, did you just do the fruit of the spirit curriculum in order or did you match them to specific GLE lessons? Oh my, I love you! Since this is my first year of doing anything formal in the terms of homeschool preschool I have been so intimidated at how to plan for the year which is so unlike me since I used to teach 4th grade for 5 years. The funny thing is that the way you mapped out above is very similar to how I would plan my school year so I don’t know why I didn’t think to carry that over into planning for preschool. I blame my pregnant mommy brain 🙂 Thanks for the encouragement and motivation to sit down later this week to actually plan how to implement the curriculum choices that I want to do this year with the kids. Oh my goodness, this looks awesome!! My husband and I are planning on homeschooling, but I haven’t known where to start. Our oldest (of three!) is just 3.5, but I’ve wanted to start the habit of “school” time early. We’ve been having “table time” every morning, where we color, go through a preschool activity book, or flashcards, but it’s felt a bit haphazard. I have experience classroom teaching, but didn’t think to lesson plan until just this weekend. And then I found your website! God’s grace there, I think! Thanks! Wonderful! Sounds like you are on the right track 🙂 so fun! I would Looooove to see your weekly word document pictured in full!! I’m so new to all of this and would love to know how you mix it up with different curriculums!